How long will it take to cure my finish? Home > Support > How long will it take to cure my finish? There are many factors that affect curing time: thickness of the curing resin, ambient temperature, distance to the lamp, center frequency of the curing resin, etc. There simply is no way to guarantee a time, and times will vary from day to day, unless the temperature is exactly the same and the coating is exactly as thick as previous curing sessions. It is important for you to understand that UV curing is half science, half art. For our testing, we use 1x3 pine strips because they are easy to work with and cheap, allowing us to run a lot of tests. We place the strips about 1-2" from the curing lamps and perform all tests in an office setting, where the temperature is around 70 degrees in the winter and slightly warmer in the summer. 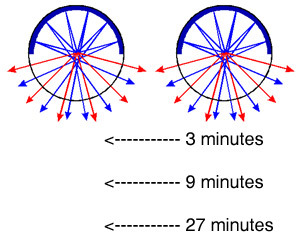 For our tests, we found curing times in the 2 to 4 minute range, using just a few lamps. There are some "tricks" to reducing your curing times, however. The hotter, the better, to a degree. The FR71 lamps like the air around them to be from 90-100F, the FR32 lamps prefer 80-90F. Anything more or less reduces UV output. Once you get below 60F or above 110F, the drop is very significant. Some people in colder climates have been known to create curing boxes and use space heaters to provide a warmer environment. Of course, this has other advantages as well, particularly with curing wood that is prone to expand and contract with temperature. Because UV output is temperature sensitive, it is often helpufl to preheat your UV curing station by turning it on 5 minutes before you use it. In colder environments, more time is helpful. This allows the lamp's internal temperature to rise and will make your curing sessions more predictable. If you measure the UV output of a lamp during the first 1-3 minutes of operation when it is cool, you will see that the output is 30-50% of normal. Once it is up to temperature, it will perform to specifications. Of course, preheating isn't required if you are doing just one piece in a session, but you should still be aware that the UV output will be much lower for the first few minutes. The amount of actual UV that reaches your curing stock is exponentially proportional to the distance. This means that cutting the distance in half (say, from 4 inches to 2 inches) doesn't just double the UV reaching the item, it quadruples it. This is called the "inverse-square law". Distance to the item is the number one factor in reducing cure times. Our kits are designed to be easy to upgrade to more lamps. Often, the problem is that someone is using 4 lamps to cure an item that really needs 8 or 12 lamps, forcing them to move the lamps far from the curing stock, and turning what should be a 5 minute cure into a 30 minute cure. You have to be realistic: the sun produces about 3.846x1026 watts of power (the equivalent brightness of 4,000,000,000,000,000,000,000,000 of our 100w lamps) if you have a large item to cure, you can't expect to match that kind of power using four 100 watt lamps that are a foot from the cure stock. It will work, but it will be slow. More lamps help offset the inverse-square law (above) because you have multiple sources of light, they produce more UV in a linear fashion, and allow for close lamp spacing and the item to be placed closer to the ultraviolet lamps.